We frequently receive requests for real world reframed development communications. In this newsletter, we’re bringing you a recent example from Youth Service Bureau of St. Joseph County (YSB) in South Bend, Indiana. YSB provides safety, shelter, and opportunities for success to youth ages 12-24 because it believes “Our community thrives when all youth are safe, have stability, and the opportunity to reach their full potential.” This reframed mission statement incorporates the Building Well-Being Narrative by referencing the construction metaphor in stressing the importance of “stability,” stating the value of human potential, and recognizing societal benefits. 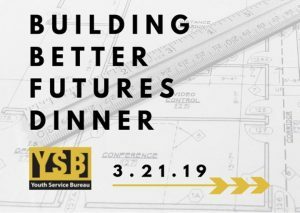 YSB succinctly extended both the value of human potential and the construction metaphor to the theme of its March 2019 annual dinner, “Building Better Futures.” Social media promoting the dinner leveraged YSB’s mission statement’s Building Well-Being Narrative elements discussed above. The dinner’s speeches, pledge cards and follow-up thank you letters reinforced the reframing language. Alluding to life cycle examples, fundraising communications referred to both teens and young adults. In line with additional reframing strategies, the messages avoided jargon, which can lead people to default to inaccurate cultural models, and alienating terms such as vulnerable, which can induce “othering.” Messaging also encompassed “all young people,” showing the universal nature of the needs. According to McGovern, reframing contributed to the successes of the appeal and dinner, and YSB has received positive feedback from stakeholders about reframing. She emphasized that YSB is committed to consistently integrating reframing broadly in all its communications, including its newsletter and grant proposals. 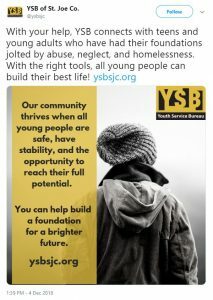 YSB also uses reframing throughout its social media, for example connecting young people’s “better life foundation” with a strong community. Partners and allies have repeated the language and shared posts of the reframed language. Module 4 rounds out the Implementation Guide by offering guidance on institutionalizing the Building Well-Being Narrative throughout communities. Human service organizations can supplement their individual efforts and achieve the benefits of formal collaboration on reframing by convening task forces, utilizing existing membership organizations, and/or establishing partnerships outside the sector to plan for and implement reframing. Module 4 provides best practices for institutionalizing the reframing process and outcomes among coalitions. National Reframing Initiative partners, Illinois Partners for Human Service and One Voice Central Texas, offer concrete examples for coalition mobilization and implementation. Finally, collected tools and resources point the way for more tips.